During the bloody disturbances of 1936, as rumors abounded that the Peel Commission would recommend a partition of Palestine, the national settlement institutions recognized that there was an urgent need to take possession of and settle certain locations, particularly where the Jewish National Fund (JNF) had bought land. Thus, within a short period, fifty "tower and stockade" settlements were established. These settlements were noted for the fact that the basis for the community was erected overnight, and included a tower with a floodlight to illuminate the surrounding area and a fence or wall surrounded the settlement point to provide protection against attack. In preparation for the publication of the Peel Commission's recommendations and under pressure from Moshe Shertok (head of the Jewish Agency's political department), and after the other candidates refused to accept it, the religious groups were allocated "Havat Zara". This was an Arab agricultural farm, the orchards (citrus and bananas) were neglected and extremely parched. 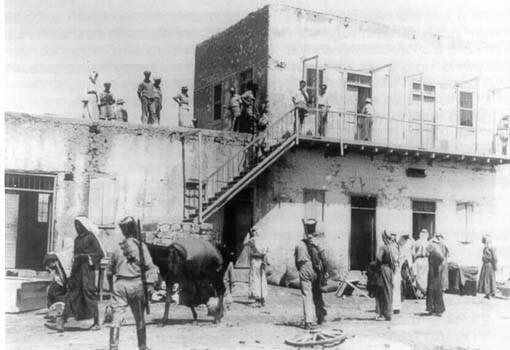 Tirat Zvi was established on Tammuz 21, 5697, June 30, 1937, in the southern part of the Bet Shean Valley as one of the tower and stockade settlements. The entity responsible for establishing the kibbutz consisted of eighty members (men and women), 20-25 years old, who belonged to the Hapoel HaMizrachi movement. Half were olim from Germany, and the rest were from Eastern Europe. Previously they had been organized in three work groups which unified to establish the kibbutz. The groups were: "Rodges" near Petach Tikva (part of this group were among the founding members of Tirat Zvi), Shachal near Rehovot, and Kfar Ya'avetz. The new settlement was called "Tirat Zvi" (Zvi's Fort) for the "fort", a two-storey mud-brick structure purchased from the effendi Musa Al-Almi. Zvi was in memory of Rabbi Zvi Hirsch Kalisher (1795-1874), one of the earliest rabbis to support immigration to Eretz Israel who viewed settlement of the land as the beginning of the redemption. In addition to the fort, agricultural tracts were purchased and irrigation rights from the adjacent spring were allocated to the new settlers and shared with the Arabs who remained in the area. After the initial mobilization, the kibbutz members began to clear the land and deal with the springs, as the water flowing from them created swamps which in turn were a source of malaria. Many attempts were made to reach a modus vivendi with the local Arabs and become trusted neighbors. Many members of Tirat Zvi learnt Arabic, the local doctor offered medical assistance to anyone in need and efforts were even made to develop commercial ties with the Arabs. Nevertheless, these were mostly unsuccessful and in the early years about thirty people were employed on a daily basis in round-the-clock guard duty to protect the community against harassment from its neighbors. The first attack on Tirat Zvi : The local Arabs failed to accept the new community, and six months after its establishment Tirat Zvi was attacked for the first time. On the evening of Adar 28, 5698, February 28 1938 at 10:30 at night, the fort was attacked by a gang of local Bedouin who carried out their attack under cover of dark. They managed to cut the fence around the wall, but they were spotted by the guards and an exchange of fire began. The Arabs approached the wall of the tower and almost managed to enter the compound. Only thanks to a hand grenade thrown at great personal risk, were they forced to retreat. Although the shooting was heard all over the surrounding area, communications with the kibbutz residents were severed as the floodlight that had been used to signal and communicate with other settlements was shattered when the fighting broke out and only after the battle was over could the kibbutz members announce that they had repelled an attack. Rumors of the repelled attack and the heroism of the fighters spread all over the country. Tirat Zvi became a symbol. It was proof that religious youngsters could also stand up and fight, just like their secular peers. News of the battle also reached British officer Orde Wingate. Wingate was called "the Friend" for helping Jewish settlements in Eretz Israel defend themselves against their Arab enemies. Wingate's first attempt to organize a Jewish fighting force was at Tirat Zvi. He arrived at the fort, gained the confidence of the kibbutz members and organized night patrols of the surrounding area, emphasizing the concept that "the location must be defended from outside rather than inside". Three months later, Wingate moved on to Kibbutz Ein Harod where he founded the Special Night Patrols. Tirat Zvi was an isolated settlement that also struggled with severe transport problems. The dirt track leading to the settlement became muddy and impassable in winter. On Elul 18, 5798, September 14, 1938, the Arabs booby trapped the road. En route to Tirat Zvi, the district officer's car hit a landmine and three passengers were killed: Haim Sturman of Ein Harod (the JNF representative in the area and redeemer of land in the Bet Shean Valley), Aharon Etkin from Geva (who represented the local communities in their dealings with the British authorities), and Dr. David Mosinsohn, a doctor and vet. (Later on, the Sahne spring [Gan Hashlosha] was called "Spring of the Three" in memory of the victims of this attack). The winter of 1938-1939 was extremely wet, leaving the settlement cut off for several weeks at a time. On Adar 17, March 8, 1939, a decision was made to send the local vehicle to the Bet Shean railway station to bring supplies and members who were returning to the kibbutz. The car was towed by a tractor and protected by guards from the kibbutz. On their way back, with the guards in front of the vehicle, they reached an Arab orchard (where Ein Hanatziv was later established) and were ambushed and fired on. In the ensuing battle the attackers were repelled but two kibbutz members were killed – Aryeh Weil and Yosef Millioner. Two others were injured (Yaakov Markovitz and another member). Other members, including Leah Gerstein (Yorav) and Ephriam Shiloh escaped unhurt. Early in the summer of 1939 the JNF had the option of purchasing land from the German Templars who lived in the southern part of the Bet Shean valley, near Tirat Zvi. The purchase of this land paved the way for agricultural development and Kibbutz Sde Eliyahu was established nearby on Lag B'Omer – May 7, 1939. However, the security situation made the desired development impossible. When local Arabs realized that the land had been sold, they destroyed the crops and uprooted the newly planted orchards, fields were set alight. There was constant tension and squabbling over pasture and water sources. Guarding the land claimed another victim. On Nissan 16 5703, April 21, 1943, Shlomo Shechter was killed while guarding the fields, trying to protect the kibbutz' pasture. The kibbutz demanded compensation and the Arabs, concerned that a bloody vendetta would ensue, agreed to mediate through leaders on both sides. Eventually, a ceasefire ("Atwa") was agreed upon followed by a reconciliation ceremony ("sulha") – confirming the kibbutz' desire to live in peace with its neighbors and not to aggravate the conflict. Malaria : We have already noted that the springs in the area were not drained properly, creating swamps which served as breeding grounds for anopheles mosquitoes responsible for spreading malaria. During their first year in the area, two thirds of the fort's residents suffered from malaria, and the kibbutz maintained convalescence services on a regular basis for members recovering from the debilitating disease at Kfar Hanoar Hadati (religious youth village). One member, Rabbi Gedalia Ouna, even died of malaria. An important branch of the young kibbutz was "anti-malaria", entailing catching the mosquitoes and spraying the breeding areas. As the mosquitoes were active mostly at night, all kibbutz members wore long-sleeved shirts and long trousers after dark, even in the scorching summer evenings and mosquito nets were draped around their beds. The members regularly took malaria-prevention medication. The malaria problem was only fully resolved after the War of Independence, when the Arabs left the area and there was full access to the springs and the swamps could be drained. Extreme temperatures : Tirat Zvi is located at the edge of the desert, with particularly high temperatures in summer and cold in winter. During the early years, the kibbutz members had no means of combating the summer heat, which often reached more than 400C. (On one occasion a temperature of more than 500C was recorded!) The members adopted a work day beginning early in the morning, with a break during the hottest midday hours, then going back to work in the afternoon. People (adults and children) cooled off by immersing themselves in pools in which the spring water was collected and where local Arab children also bathed. (In those days, there were no showers in members' rooms and one public shower served the entire community!) On summer nights, members took their beds outside and slept outdoors, with the nets protecting them against attack by the mosquitoes. The design of the buildings was also influenced by the climate, and each house was surrounded by a canopy that provided shade. Hatches were made in each room to allow cool air to penetrate. Over the years fans were installed, alleviating the oppressive heat somewhat. Another improvement was "drippers" – a form of mattresses placed outside the windows, with a hose constantly dripping water on them. The hot air passed through the drippers, cooling down on its way into the rooms. In winter, temperatures dropped at night, sometimes falling below freezing. The kibbutz members, who had no agricultural experience in such conditions, planted a large banana plantation as well as vegetables such as tomatoes, peppers and like. They soon realized that such crops suffered from the cold and were not suited to their climate. The members would set out on the cold nights and light bonfires to protect their crops from frost. There were other methods as well, although eventually they learnt what could and could not be cultivated at Tirat Zvi. Despite the fact that all the members belonged to one movement, there were significant cultural and educational differences between those members originally from Germany and others who came from Eastern Europe. There were frequent disagreements, particularly when the "yekkes" looked askance at their colleagues from Romania and Poland, when they had to decide whether they would eat "cholent" on Shabbat – an East European dish, or potato salad ("kartoffel salat") – a German dish. A vote was held to decide on the relevant version of prayer – "nusach Ashkenaz" was adopted by all. A few years later all these problems were forgotten and Tirat Zvi is now known as a thriving, warm, hospitable kibbutz which prides itself on its culinary standards appreciated throughout the kibbutz movement. The members of Tirat Zvi had no experience in raising children, and the first nanny came from Rodges to train the young mothers. Female members of Tirat Zvi set out to learn a new profession – childcare. One of the carer's assignments was to compose songs for the younger generation. As the children grew up a school was opened on site, although the first teachers were brought in from outside the kibbutz. When the oldest children reached high-school age they were sent to Kvutzat Yavne to join others of their own age and complete their education. Before long a school was opened at Sde Eliyahu to serve all the children of the Bet Shean valley kibbutzim so that they no longer had to be sent so far afield. Despite the various difficulties, Tirat Zvi was a magnet for religious youngsters, and as the first and oldest kibbutz of the Religious Kibbutz Movement (HaKibbutz HaDati) numerous graduates of the Bnei Akiva youth movement from Israel and olim from overseas passed through Tirat Zvi, staying for various periods of time in order to prepare themselves for other settlement projects. The first ten years at Tirat Zvi were a period of trial and indecision in all aspects of life: social, security, economic and agricultural. There were numerous attempts to develop a variety of agricultural branches, not all of which were successful, and the kibbutz economy faced great financial insecurity. Nevertheless, the barrier was eventually broken and the settlement grew. 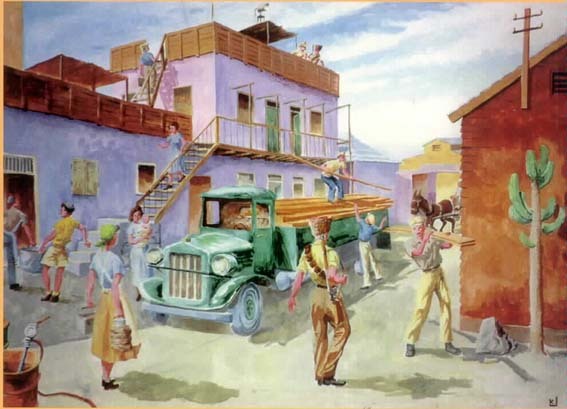 In 1946 the idea of a meat factory was proposed, which started out in the old fort building that was no longer used for residential purposes. The UN decision of November 29, 1947 to partition Eretz Israel caused further tension that once again threatened to disrupt life within the community which had begun to settle into some normal routine. The Arabs refused to accept the UN's partition plan and decided to attack and destroy Tirat Zvi. The attack was carried out by Kaoukji's Liberation Army. It began on the morning of Adar 6 – February 16, 1948 (two months before the establishment of the State of Israel) and a force of several hundred irregular Arabs participated in the attack. Shooting started at four in the morning followed by an attempt to overrun the kibbutz. The attacks were repelled by the kibbutz fighters although one kibbutz member, Naftali Friedlander, was killed at his position. At dawn, the kibbutz was shelled and the Arabs once again attempted to overrun it. Just then, heavy rain began to fall, turning the area into a quagmire and jamming the guns. The kibbutz defenders mobilized to deal with their weapons, in contrast the attackers were in a much more difficult position. Their weapons were unusable and they were stuck in the mud. Realizing that their attack could not possibly succeed, they began to retreat, leaving behind many wounded, as well as their guns and shoes so that they could run away more easily. When the reinforcements who had been called to Tirat Zvi arrived, the battle was over and all that was left was to comb the area and help collect the booty. Tirat Zvi's victory had an enormous impact on settlements all over the country. Until then, the Arabs had not attempted to conquer Jewish settlements using organized military forces. This was the first time that Jews in Eretz Israel had proved themselves in military combat and shown that they could defend the new communities they had established. The outcome was a turning point in the annals of Tirat Zvi. The following day, local Bedouin could be seen riding their donkeys away from the Jewish settlement. Some crossed the River Jordan to join other members of their tribe in Trans-Jordan, others traveled south to the central Jordan Valley. From then on, all the land in the area was Jewish. The Arabs did not try to attack Tirat Zvi again and the kibbutz was able to send its members to assist the IDF which began to defend the nascent state. In the summer of 1948 Iraqi forces arrived in the Bet Shean Valley and attempted to conquer key locations. One such point was Tel Radara (now Tel Shalem), situated south of Tirat Zvi. On September 27, 1948, during one of the mortar attacks, Avraham Haber, a member of the hevrat noar attending school on the kibbutz, was killed. The Tel remained as an army outpost marking the border until the Six Day War. The spring at the foot of the outpost was called Abraham's Spring (ma'ayan Avraham) in his memory. After the War of Independence, the members could now devote themselves to developing their kibbutz. In 1952 a road connecting Tirat Zvi with Bet Shean, which had meanwhile become a Jewish development town, was finally paved. Agriculture was developed and included: field crops (wheat, alfalfa, cotton, vegetables, grapes, olives, pomegranates, and dates). Fish farming and chicken coops were also developed, and there were efforts to raise cattle for meat. The dairy herd encountered severe difficulties and the branch was closed in 1959. Cattle for beef was also problematic, and the branch was closed in 1967. Tirat Zvi was shelled during the first two days of the Six Day War, although little damage was sustained. Some houses were hit but there were no injuries. After the Jordan Valley was conquered, Tirat Zvi no longer marked Israel's southern border in the Bet Shean Valley. However, the eastern border with Jordan remained a trouble spot. During the winter of 1968 terrorists attempted to infiltrate the kibbutz and damage the factory. They were discovered by the guards and driven away. The entire Bet Shean Valley once again became a front-line area, coming under heavy attack with the children sleeping in bomb shelters most nights. During this period the kibbutz enjoyed the assistance of many volunteers and a sense of solidarity on the part of the country's residents and volunteers from overseas. Following this war of attrition, Tirat Zvi entered a period of social and economic recovery. The kibbutz economy developed and expanded, accompanied by an intellectual and educational development of the next generation.